Myrtus communis growing shrub‎ or tree of the genus Myrtus also known as Common myrtle, Myrtus communis perennial evergreen plant the fruit edible also used as ornamental hedge fragrant plant or as medical plant, can grow in mediterranean, subtropical, temperate climate or as houseplant and growing in hardiness zone 8-11. Leaves fragrant color green to dark green, leaves shape elliptic in pointed top size 2-5 cm. Flower color white with five petals and multi stamens the stamens create shape like brush. Fruit edible color purple or yellow, fruit are round with crown size 0.5-2 cm. 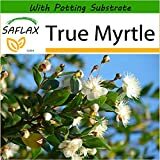 Myrtus communis COMPACT COMMON MYRTLE Seeds! Myrtus communis COMMON MYRTLE Seeds! Have one to sell? 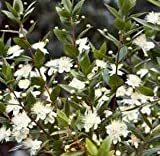 Sell now Details about Myrtus communis COMPACT COMMON MYRTLE Seeds! 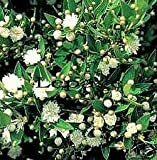 What can be done with big quantities of Myrtus communis fruits?